Our Saturday morning took us from Gardiner to Lamar. Saw a couple of smaller black bears along Tower Road. Lamar was very quiet except for a nice sized bull moose near Pebble Creek. I know the wolf folks were having fun at Slough Creek watching pups through their scopes. Drove down to Hayden Valley. Missed Obsidian Sow and cub by about 10 minutes. Drove up to Sylvan Lake and did not see any bears. Then returned to Mammoth via Norris. One of those "you just missed" days. Sunday, we spent most of the day with the Tower Triplets and the other black bear and coy near Calcite. Decided to make a mid morning trip down to Hayden. Had about a four year old Grizzly stroll out of the woods and walk in front of us and one other truck on the downhill side of Dunraven Pass about three miles before Canyon. The bear was nice enough to stop and pose for about 20 seconds to check us out before continuing on his journey through the still snow covered woods. 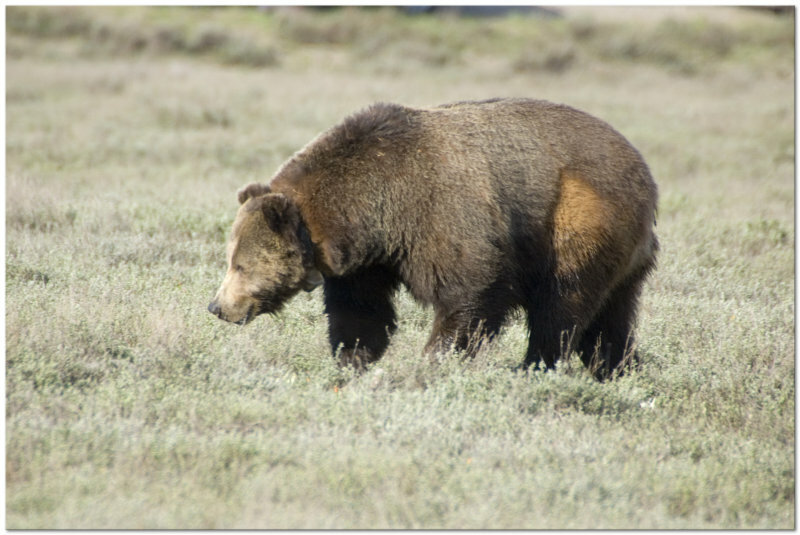 He was a beautiful dark colored grizzly - certainly a bear I had never seen before and after talking to several folks, not the bear that hangs out occasionally around Canyon. Drove out of the East Entrance and spent the night in Cody. As always the drive was beautiful, but the Bighorns and bears and moose we sometimes see evaded us on this day. No signs of Raspberry or Snow on the way out or back. Likely a few days early for them and they will likely not be together this year anyways. Monday, we drove down to Grand Teton. Missed 399 and cubs by about 5 minutes in the morning. The Teton jams are catching up with the Yellowstone ones fast. In the evening, we waited for 399 and cubs and followed them along Pilgrim Creek road from the highway for several hours. Finally our patience paid off and they came into a clearing before Pilgrim Creek . The cubs tumbled and play fought and they all kind of just hung out for around 45 minutes 75-100 yards from the crowd. The Rangers were outstanding and the experience was great. After 399 and cubs disappeared into the forest, Blondie and her cubs made an appearance near Pilgrim Creek Road. They were a ways off the road, but out in plain site and my trusty Tamron 150-600 let me get some ok shots. This was the first time I had the pleasure of photographing Blondie and about my 10th time with 399. On the way back to our hotel in Jackson, we saw an absolutely stunning Elk with what amounted to an already large rack in full velvet. That is going to be one incredible animal to see by July. Today, we spent the morning with Blondie and Cubs who had kind of taken over 399's spot near Pilgrim Creek Road. I think we got some really good pictures. During that same period, 399 took an Elk calf across from Jackson Lake Lodge a ways off the road. Too far for decent pictures I was told. We stayed with Blondie. Drove back to Jackson for lunch and a nap. Saw a yearling Moose near Moose, but did not see the Cow moose and newborn that others had seen. Went back this evening and found neither 399 nor Blondie, even with a lot of people waiting for them. Later we found out why. About 1.5 miles north of Pilgrim Creek, we literally stumbled across a very large boar grizzly that was right by the road. He was so close we decided to stay behind our car. We were trying to decide what to do with the uninformed who were approaching this boar trying to take a picture with their cell phones from 20 yards. Both my nephew and i had our bear spray ready but fortunately we did not have to use it on the tourists..er I mean bear. The rangers arrived about 7 minutes later and took over the scene. Ended up getting some beautiful pictures of him. Apparently, we were looking at Brutus. Funny enough the volunteer bear control person knew him only by nickname and not by his number. She said it is rare to see him by the road although hikers bump into him on occasion. Sounds like Brutus is Blondie's dad or so they think. No one has done a DNA test and they have not appeared on any reality television shows together. It was a fantastic 20 minutes before he wandered into the forest. Tomorrow is our last day as we will drive through both Grand Teton and one last drive through Yellowstone before stopping in Bozeman for the night before driving home to Washington. The time in Grand Teton has been amazing. Hopefully we will see some of you at the pullout. Have a ton of pictures to go through and will try to post some in the not too distant future. Thanks for the report. It's been many years since I've been able to hit the Tetons in spring, so it's always nice to hear how things are going down there. Nice report,glad to see that you had some good sightings. Is this "Brutus" ? shot this at Pilgrim Rd 2 years ago and no one including Rangers knew very much about him,At that time just like your sighting he was in close(but not next to)proximity to a sow with cubs.The pic does not do justice,this guy was big. Great report! Thanks so much. I had so much fun reading it and experiencing all of it with you. It was almost like being there (or at least the next best thing when you can't be there ). We'll be there in a little while and your great stories have us SO excited! Hope it won't be TOO crowded but do enjoy when many people can enjoy wonderful experiences like you described. Thanks for the news from Hayden/East Entrance area. We didn't get down that way last time and are looking forward to trying it. Quick question -- how bad is the traffic jam at Gros Ventre where they are building the traffic circle? And is Moose-Wilson open and OK to travel? Again, thanks so much for the report. Sorry you'll be leaving before we get there. It would be nice to share an animal experience with you! Correction to earlier post - the Boar's "name is Bruno, not Brutus.My nephew has a better memory than me. The traffic work at Gros Ventre was not bad while we were there, but according to the signs, it was "inactive" at the time specifically referring to a website and future updates. Moose Wilson was open and it does not appear the work has started left other than stakes put out. That looks like him and he was collared. I will double check the picture. He is a BIG boy!